Win some, lose some, change is a comin’ to Washington, D.C. and Donald Trump’s life. A day after the Midterm Election 2018, the podcast posted at Halli Casser-Jayne dot com, Halli and her partner in politics journalist Matthew Cooper take a look at the state of the nation after the historical vote that put the Democratic Party back in control of the House of Representatives but allowed Republicans to maintain control of the Senate. As we do every week, newsman Matthew Cooper joins Halli for our politics segment, PODCAST AMERICA, in which Matt and Halli slice and dice all things politics. And what a week it has been. Democratic stars Andrew Gillum in Florida, Stacey Abrams in Georgia, and Beto O’Rourke in Texas were spotlight races because they seemed impossible, but Gillum and O’Rourke didn’t quite pull it off. The Blue Wave really was a wave, but not quite as big a wave as pollsters thought. The Democrats took back the House after 8 years and the Republicans maintained control of the Senate. It appears health care has been saved, Democrats get subpoena power, the Robert Mueller investigation is protected, a ton of Democratic women and minorities will take their place in Congress and in State Houses in both blue and red states. Yes, Democrats permeated the red wall, and what has been called Trumpism might be on the run. Yep, it is true, you win some and you lose some. Win some, lose some, change is coming to Washington, D.C. and Donald Trump’s life. Join Halli and Matthew Cooper on The Halli Casser-Jayne Show the podcast posted at Halli Casser-Jayne dot com. From Charlottesville to Pittsburgh to November 6th and the 2018 midterm elections, Halli and Matthew Cooper take a look at the state of our politics on The Halli Casser-Jayne Show, the podcast posted at Halli Casser-Jayne dot com. As we they do every week, newsman Matthew Cooper joins Halli for our politics segment, PODCAST AMERICA, in which Halli and Matt slice and dice all things politics. This week they cover the state of our politics as we approach the midterm elections from Charlottesville to Pittsburgh and the horrific massacre of eleven Jews, the MAGAbomber, a look at anti-Semitism in the Age of Trump, Vice President Pence, Donald Trump, Jr. and Kimberly Guilfoyle, Andrew Gillum, the plight of the migrants, and so much more. With only six days to go, Halli and Matt’s midterm update includes a conversation about Beto O’Rourke, Heidi Heitkamp, will Claire McCaskill pull off her re-election?, Trump and his genius of dangling shiny objects before the press and Trump’s dog whistling and bogeyman tactics. It’s from Charlottesville to Pittsburgh and the mid-term elections, right-wing conspiracies, White Supremacists, the Republican Party, will Nancy Pelosi be the next Speaker of the House?… all on The Halli Casser-Jayne Showthe podcast posted at Halli Casser-Jayne dot com. Washington Post political blogger and author Greg Sargent and Washingtonian Magazine’s Matthew Cooper talk all things politics in the Age of Trump as we approach the midterm elections on The Halli Casser-Jayne Show, the podcast posted at Halli Casser-Jayne dot com. As we do every week, newsman Matthew Cooper joins me for our politics segment, PODCAST AMERICA, in which Matt and I slice and dice all things politics. Matthew Cooper is known for his in-depth reporting and analysis from Washington. Mr Cooper has worked for some of America’s most prestigious magazines including Time, Newsweek, The New Republic, National Journal and U.S. News & World Report. He now serves as a contributing editor to Washingtonian magazine. For the record, Cooper also earned national attention during the CIA leak case when he was held in contempt of court and threatened with imprisonment for his refusal to name his sources and to testify before the Grand Jury regarding the Valerie Plame CIA leak investigation, a case that went all the way to the Supreme Court. He has appeared on 60 Minutes,Meet the Press, Hardball, The O’Reilly Factor and This Week with George Stephanopoulos. He has covered Donald Trump extensively, his hard-hitting and insightful profiles of “The Donald” always well-worth the read. 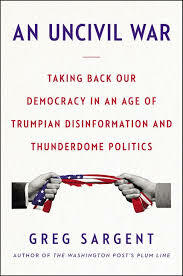 In AN UNCIVIL WAR: TAKING BACK OUR DEMOCRACY IN AN AGE OF TRUMPIAN DISINFORMATION AND THUNDERDOME POLITICS, journalist Greg Sargent who writes the popular “Plum Line” blog at The Washington Post doesn’t fool around. He says that American democracy is facing a crisis as fraught as we’ve seen in decades and Donald Trump’s presidency has raised the specter of authoritarian rule. He notes that extreme polarization and the scorched-earth war between the parties drags on with no end in sight. And makes the case that at the heart of this dangerous moment in American history is a paradox: It took a figure as uniquely menacing as Donald Trump to rivet the nation’s attention on the fragility of our democracy. Yet the causes of our dysfunction are long-running and predate Trump. It is these ‘causes’ that helped facilitate the rise of Trump, and, distressingly, will outlast his presidency. In an account that includes numerous interviews with political operatives and strategists in both parties, political scientists and historians, Sargent argues why we cannot shy away from big arguments over our democratic future and considers what must be done to save it. Washington Post, politics, Election 2018, Trump, Civil War, democracy, Democrat vs. Republican, Progressive, Conservative on The Halli Casser-Jayne Show with Washington Post journalist and author AN UNCIVIL WAR Greg Sargent and Washingtonian magazine journalist Matthew Cooper,this week on The Halli Casser-Jayne Show, the podcast posted at Halli Casser-Jayne dot com. 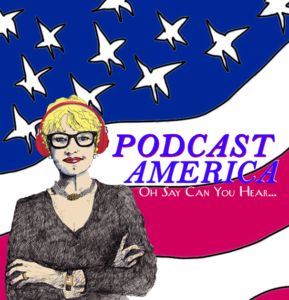 Politics and women in Trump Era are the subject of The Halli Casser-Jayne Show, the podcast posted at Halli Casser-Jayne dot com, when joining Halli at her table is author Hallie Iglehart Austen, THE HEART OF THE GODDESS, and for our weekly political review, Podcast America, journalist Matthew Cooper. As we do every week, newsman Matthew Cooper joins me for our politics segment, PODCAST AMERICA, in which Matt and I slice and dice all things politics. Matthew Cooper is known for his in-depth reporting and analysis from Washington. Mr Cooper has worked for some of America’s most prestigious magazines including Time, Newsweek, The New Republic, National Journal and U.S. News & World Report. He now serves as a contributing editor to Washingtonian magazine. For the record, Cooper also earned national attention during the CIA leak case when he was held in contempt of court and threatened with imprisonment for his refusal to name his sources and to testify before the Grand Jury regarding the Valerie Plame CIA leak investigation, a case that went all the way to the Supreme Court. He has appeared on 60 Minutes,Meet the Press, Hardball, and This Week with George Stephanopoulos. He has covered Donald Trump extensively, his hard-hitting and insightful profiles of “The Donald” always well-worth the read. Politics and Women in Trump Era. It doesn’t take a rocket scientist to recognize that women are at war with each other. Progressive women and Conservative women don’t see eye to eye on just about anything. Advocate pro-choice or abolish Roe v. Wade, the MeToo movement, Trump, stay at home to raise your children or become the next CEO of a large corporation are some of the issues at the heart of the division. It’s an either or, black and white division in which the middle ground lays bare who women are at their core. The only thing most thoughtful women can agree upon is that the division runs deep and threatens all women’s best interests. There are many roads to wonder down if we want to fix this massive schism. We begin first with who are women? How have women been seen by others throughout history? How have women seen themselves in the past and how do women see themselves now? How does our modern-day politics effect our realities? 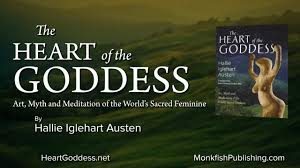 In her book THE HEART OF THE GODDESS, author Hallie Iglehart Austen takes us on a trip from the Ice Age to the present, from Nigeria to Hawaii sharing with us images of the Goddess, offering a soulful exploration of what it means to be women through the ages, offering us an empowering journey into the heart of women leading us to the one thing all women share in common: our sacred, divine feminism. Politics and women in Trump Era, Roe v. Wade, women’s rights, feminism, Trump, misogyny, the women’s movement on The Halli Casser-Jayne Show with author Hallie Iglehart Austen and journalist Matthew Cooper, this week on The Halli Casser-Jayne Show, the podcast posted at Halli Casser-Jayne dot com. Nikki Haley resignation, the mid-term election, and all things American politics as well as a look at the new book THE DISRUPTORS, 50 PEOPLE WHO CHANGED THE WORLD — oh the fun we have this week on The Halli Casser-Jayne Show the podcast posted at Halli Casser-Jayne dot com when my guests are author Alan Axelrod and joining me at my table for our weekly politics segment, Podcast America, journalist Matthew Cooper. 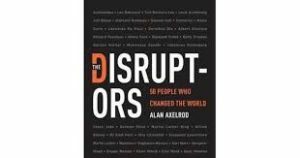 “Until recently ‘disruption’ was a bad word, plain and simple.” That is how Alan Axelrod begins his new book: THE DISRUPTORS, 50 PEOPLE WHO CHANGED THE WORLD. Nevertheless, Axelrod has titled his book THE DISRUPTERS and he defines disrupters as those who upend cultural, technical, spiritual, and scientific paradigms and thus alter the way we live forever. What does Charles Darwin have in common with Steve Jobs – or with Jackson Pollock, Martin Luther, Betty Friedan, Johannes Gutenberg and DJ Kool Herc? They were “DISRUPTORS.” From the invention of the printing press to the fight for women’s equality, from the smartphone to the invention of hip-hop, each visionary in Alan’s book upended our world as we knew it, changing our lives forever, some might say for the better, some for the worse. For those who don’t know ALAN AXELROD, Alan is the author of more than 100 books. He is the co-author of the New York Times bestseller WHAT EVERY AMERICAN SHOULD KNOW ABOUT AMERICAN HISTORY as well as the Businessweek bestsellers PATTON ON LEADERSHIP and ELIZABETH I, CEO. He has appeared on numerous TV and radio programs and in magazine and newspaper articles. Nikki Haley resignation, the midterm elections, politics, Roe v. Wade, people who have changed our world, a fascinating show with journalist Matthew Cooper and author Alan Axelrod this week on The Halli Casser-Jayne Show, the podcast posted October 10, 3 pm ET at Halli Casser-Jayne dot com. Kavanaugh vote, FBI Report, Dr. Christine Blasey Ford, Brett Kavanaugh and a look at a terrific new book every bibliophile will love, 1,000 BOOKS TO READ BEFORE YOU DIE — oh the fun we have this week on The Halli Casser-Jayne Show, Wednesday, October 3, the podcast posted 3 pm ET at Halli Casser-Jayne dot com when my guests are author James Mustich and joining me at my table for our weekly politics segment, Podcast America, is journalist Matthew Cooper. As we do every week, newsman Matthew Cooper joins me for our politics segment, PODCAST AMERICA, in which Matt and I slice and dice all things politics. Matthew Cooper is known for his in-depth reporting and analysis from Washington. Mr Cooper has worked for some of America’s most prestigious magazines including Time, Newsweek, The New Republic, National Journal and U.S. News & World Report. He now serves as a contributing editor to Washingtonian magazine. For the record, Cooper also earned national attention during the CIA leak case when he was held in contempt of court and threatened with imprisonment for his refusal to name his sources and to testify before the Grand Jury regarding the Valerie Plame CIA leak investigation, a case that went all the way to the Supreme Court. He has appeared on 60 Minutes,Meet the Press, Hardball, The O’Reilly Factor and This Week with George Stephanopoulos. He has covered Donald Trump extensively, his hard-hitting and insightful profiles of “The Donald” always well-worth the read. Among this week’s topics, the Kavanaugh vote. 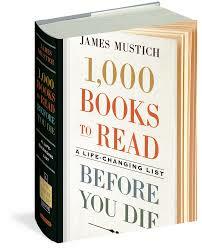 We take a brief respite from politics in our second half-hour when I am joined by James Mustich, the author of 1,000 BOOKS TO READ BEFORE YOU DIE: A LIFE-CHANGING LIST. If as I do, you love books, boy do I have a book to recommend for you today and an interesting conversation when I speak with the book’s author James Mustich, the co-founder of the acclaimed book catalog, A COMMON READER. In his new catalogue of the greatest books of all times, as compulsively readable, entertaining, surprising, and enlightening as the thousand books it recommends, organized A–Z by the author, the selections takes the reader on a rollercoaster of entries: For example, Flora Thompson’s LARK RISE TO CANDLEFORD is followed by Hunters S. Thompson’s FEAR AND LOATHING IN LAS VEGAS and then by the children’s favorite, ELOISE. The result is an unexpectedly revealing juxtaposition of literature packaged in a beautifully designed book, enlivened throughout with extensive illustrations, its compilation of brief, yet informed and thought-provoking essays accompanying each title, giving the reader a sense of the work’s historical and literary context and the reason why the book is on the list. Extensive, intelligent, it’s a lively library in a book in which readers of all ages will find books to add to their personal collections and to-be-read piles. It is the ultimate gift book for bibliophiles, a veritable treasure trove that brings reading back to the center of our cultural conversation. Kavanaugh vote, accuser Dr. Christine Blasey Ford, Brett Kavanaugh, The Senate, the Supreme Court, Roe v. Wade, books and more books, a fascinating show this week on The Halli Casser-Jayne Show, the podcast posted October 3, 3 pm ET at Halli Casser-Jayne dot com. Christine Blasey Ford, Brett Kavanaugh, the Kavanaugh vote and a look at RULE MAKERS, RULE BREAKERS and how our classification effects our politics with cultural psychologist and author of the book of the same title, Michele Gelfand, the topics we explore on The Halli Casser-Jayne Show the podcast posted at Halli Casser-Jayne dot com. Also joining me at my table in our weekly politics segment, Podcast America, is journalist Matthew Cooper. As we do every week, newsman Matthew Cooper will join me for our politics segment, PODCAST AMERICA, in which Matt and I slice and dice all things politics. Matthew Cooper is known for his in-depth reporting and analysis from Washington. Mr Cooper has worked for some of America’s most prestigious magazines including Time, Newsweek, The New Republic, National Journal and U.S. News & World Report. He now serves as a contributing editor to Washingtonian magazine. For the record, Cooper also earned national attention during the CIA leak case when he was held in contempt of court and threatened with imprisonment for his refusal to name his sources and to testify before the Grand Jury regarding the Valerie Plame CIA leak investigation, a case that went all the way to the Supreme Court. He has appeared on 60 Minutes,Meet the Press, Hardball, The O’Reilly Factor and This Week with George Stephanopoulos. He has covered Donald Trump extensively, his hard-hitting and insightful profiles of “The Donald” always well-worth the read. 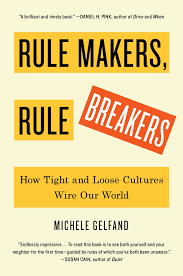 In her provocative new book, RULE MAKERS, RULE BREAKERS: HOW TIGHT AND LOOSE CULTURES WIRE OUR WORLD, celebrated cultural psychologist Michele Gelfand shows that much of the diversity in the way we as a people think and act derives from a simple difference—“tight” (rigid social norms) versus “loose” (weak social norms). Sensing threats, tight cultures (whether large nations or small, close-knit groups) insist on social order. Feeling safe, loose cultures promote individual expression—sometimes to excess. Is this the source of America’s great divide and how, for instance, do we apply this theory to opinions on Kavanaugh accuser Dr. Christine Blasey Ford? A Distinguished Professor at the University of Maryland, College Park, Gelfand used field, experimental, computational, and neuroscience methods to understand the evolution of culture–as well as its multilevel consequences for human groups. Her work has been cited over 20,000 times and has been featured in the Washington Post, the New York Times, the Boston Globe, National Public Radio, Voice of America, Fox News, NBC News, ABC News, The Economist, among other outlets. In an era that is more divided than ever, RULE MAKERS, RULE BREAKERS offers a startling new lens through which we can see exactly why others stake out the positions they do, and with that new perspective, reap—for the first time—the benefits other cultures have to offer. Kavanaugh Accuser Dr. Christine Blasey Ford, Brett Kavanaugh, politics, sexual abuse, the Supreme Court, Roe v. Wade, are you a rule maker or a rule breaker…a fascinating show this week on The Halli Casser-Jayne Show, the podcast posted at Halli Casser-Jayne dot com. Brett Kavanaugh, Dr. Christine Blasey Ford, and a conversation we can all use in these stressful times on the practice of meditation, all topics we’ll explore on The Halli Casser-Jayne Show the podcast posted at Halli Casser-Jayne dot com. Joining me at my table in our weekly politics segment, Podcast America, is journalist Matthew Cooper. 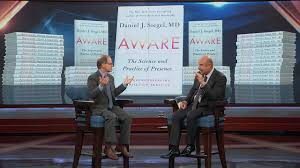 And in the second half-hour the preeminent expert on the human mind, Dr. Daniel Siegel, introducing his new book AWARE: THE SCIENCE AND PRACTICE OF PRESENCE. As we do every week, newsman Matthew Cooper will join me for our politics segment, PODCAST AMERICA, in which Matt and I slice and dice all things politics. This week, Brett Kavanaugh vs. Dr. Christine Ford. Matthew Cooper is known for his in-depth reporting and analysis from Washington. Mr Cooper has worked for some of America’s most prestigious magazines including Time, Newsweek, The New Republic, National Journal and U.S. News & World Report. He now serves as a contributing editor to Washingtonian magazine. For the record, Cooper also earned national attention during the CIA leak case when he was held in contempt of court and threatened with imprisonment for his refusal to name his sources and to testify before the Grand Jury regarding the Valerie Plame CIA leak investigation, a case that went all the way to the Supreme Court. He has appeared on 60 Minutes,Meet the Press, Hardball, The O’Reilly Factor and This Week with George Stephanopoulos. He has covered Donald Trump extensively, his hard-hitting and insightful profiles of “The Donald” always well-worth the read. Daniel J. Siegel, MD, is one of the preeminent experts on the human mind. He is clinical professor of psychiatry at the UCLA School of Medicine, founding co-director of the UCLA Mindful Awareness Research Center, and executive director of the Mindsight Institute. He is also an award-winning educator, a Distinguished Fellow of the American Psychiatric Association. In his new book AWARE: THE SCIENCE AND PRACTICE OF PRESENCE, THE GROUNDBREAKING MEDITATION PRACTICE, Siegel shares the science behind his groundbreaking meditation practice, revealing that improving the health of one’s mind can change the health of the body. In AWARE, Dr. Siegel examines the positive effects of meditation and offers an in-depth look at the science that underlies its effectiveness introducing readers to his popular Wheel of Awareness practice, which encourages a healthier brain and can reduce fear, anxiety, and stress. Siegel promises that if you maintain his practice you can improve immune function, keep cells, and you, youthful, well-functioning, and healthy, prevent life-threatening inflammation, modify cardiovascular factors, improving cholesterol levels, blood pressure, and heart function and improve self-regulation, problem-solving, and adaptive behavior that is at the heart of well-being. Does all this sound like hocus pocus? We’ll talk with the author of AWARE Dr. Daniel Siegel. Brett Kavanaugh, Dr. Christine Blasey Ford, mediation, the Supreme Court, Roe v. Wade, sexual abuse, Me, Too!, a fascinating show this week on The Halli Casser-Jayne Show, the podcast posted at Halli Casser-Jayne dot com. Bob Woodward FEARLESS, Trump’s sinking poll numbers, a conversation about the great paradox of the digital age — the internet connects us to countless numbers of people and yet we feel more isolated than ever,” are just some of the subjects tackled on this week’s The Halli Casser-Jayne Show when joining Halli at her table is veteran White House correspondent Matthew Cooper and Radha Agrawal — a community force to be reckoned with the author of an important new book BELONG. The podcast will be posted at Halli Casser-Jayne dot com. From now through election day 2018, newsman Matthew Cooper will be co-hosting a weekly half-hour segment, PODCAST AMERICA, on The Halli Casser-Jayne Show in which Halli and Matt slice and dice all things politics. Matthew Cooper is known for his in-depth reporting and analysis from Washington. Mr Cooper has worked for some of America’s most prestigious magazines including Time, Newsweek, The New Republic, National Journal and U.S. News & World Report. He now serves as a contributing editor to Washingtonian magazine. For the record, Cooper also earned national attention during the CIA leak case when he was held in contempt of court and threatened with imprisonment for his refusal to name his sources and to testify before the Grand Jury regarding the Valerie Plame CIA leak investigation, a case that went all the way to the Supreme Court. He has appeared on 60 Minutes,Meet the Press, Hardball, The O’Reilly Factor and This Week with George Stephanopoulos. 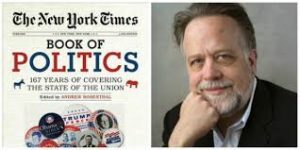 He has covered Donald Trump extensively, his hard-hitting and insightful profiles of “The Donald” always well-worth the read. Here’s something to twirl around your brain besides Bob Woodward FEARLESS: “It’s the great paradox of the digital age — the internet connects us to countless numbers of people and yet we feel more isolated than ever.” Radha Agrawal — is a community force to be reckoned with, the co-Founder, CEO and Chief Community Architect of Daybreaker, the early morning dance and wellness move-ment that currently holds events in 25 cities and over a dozen college campuses around the world with a community of almost half a million people, the successful entrepreneur (Co-Founder THINX, LiveItUp), author, globe trotting speaker, DJ, inventor, and investor. 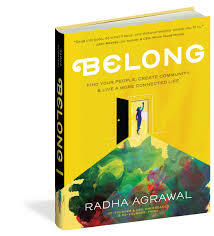 In her new book BELONG, FIND YOUR PEOPLE, CREATE COMMUNITY & LIVE A MORE CONNECTED LIFE, Agrawal answers the questions for us that she answered for herself at the age of 30: “How the heck do I find my people?” and “How do I create large and meaningful communities in the real world?” Agrawal spent 18 months synthesizing her key methods for community building, peeling back the curtain on exactly what she and her team did (and continues to do) at Daybreaker so that anyone interested in creating their own community could have a blueprint for how to do it. Named by MTV as “one of 8 women who will change the world,” The world is a lonely place, but it doesn’t have to be. Bob Woodward FEARLESS, Election 2018, Brett Kavanaugh, Roe vs. Wade, It Takes a Village, loneliness, community, politics books all on The Halli Casser-Jayne Show the podcast posted 3 pm ET at Halli Casser-Jayne dot com.